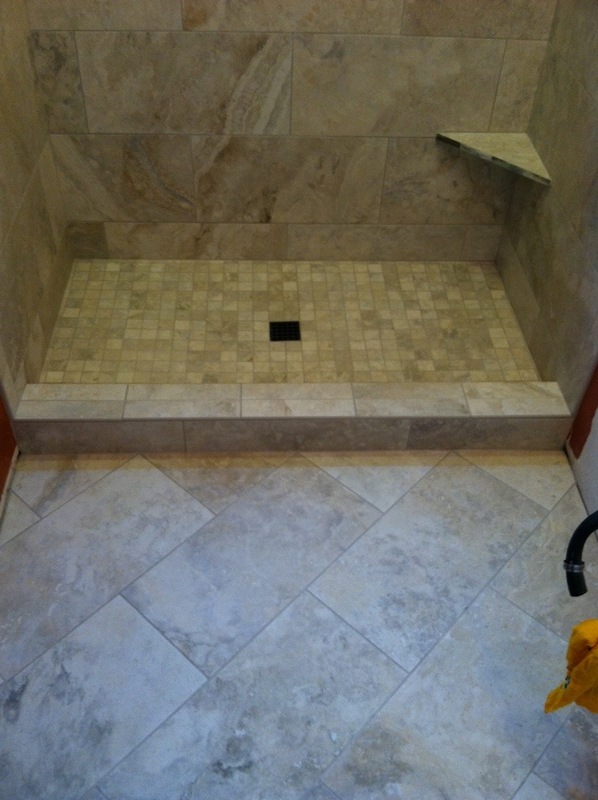 This shower was done in Temecula Ca by Hamilton Tile and Stone. The bathroom still needs to be painted and I will update with new pictures at a later date. Kerdiboard by Schluter was used as the substrate for a 100% waterproof substrate. The tile is 16×24 porcelain from Arizona tile. The glass tile accent band also from Arizona tile. What a nice transformation from the old fiberglass shower. Recessed niche’s add beauty and extra storage space for personal hygiene products. 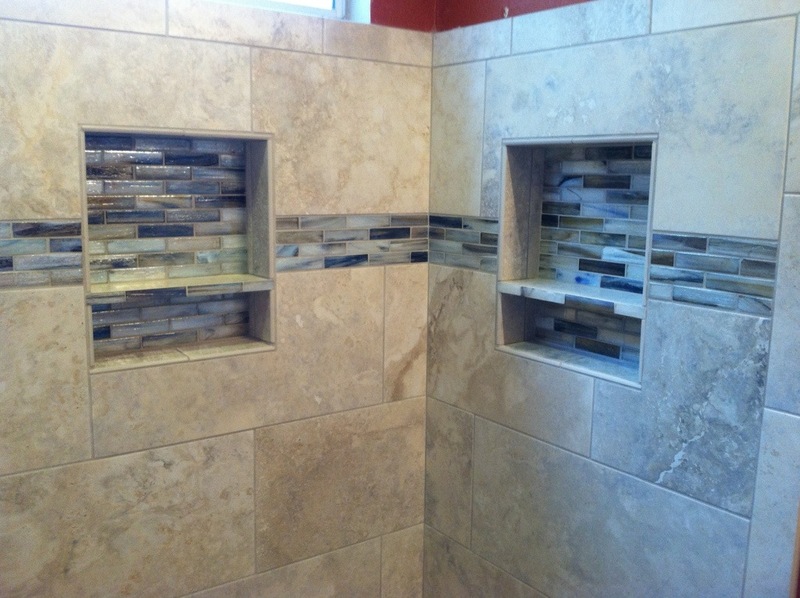 Here is another view of the recessed niche’s and the glass tile used. This is not a seat, but rather a shelf to rest your foot on while shaving. 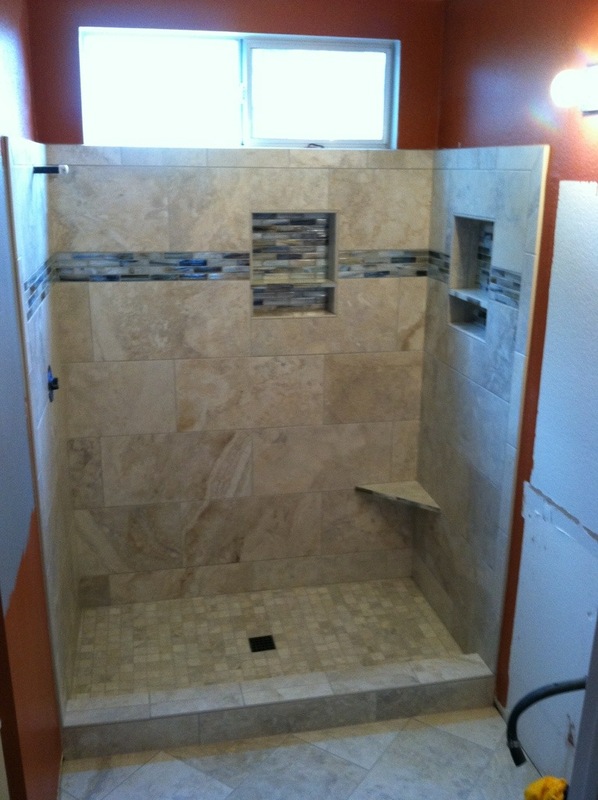 This entry was posted in Uncategorized and tagged Arizona Tile, Glasstile, Hamilton Tile and Stone, Kerdiboard, Leak free shower, mosaic glass, mosaic tile, Murrieta Tile Contractor, Porcelain, Schluter Kerdi, Schluter Kerdiboard, Shower Remodel, Temecula Tile Contractor, Temecula Tile Installer, Tile contractor, Waterproof Shower, Waterproof Shower System. Bookmark the permalink. Both comments and trackbacks are currently closed.